NOLA is turning three and we're throwing one hell of a party. Over two beer filled days we'll be pouring our staff's favourite beers over the past three years, plus a bunch of brand new beers brewed just for the weekend will be unwrapped each hour. The NOLA laneway will come to life with live tunes all day, beer art, a whisky cocktail bar and speed caricatures. Oh and did we mention we’ll be giving away fried chicken (while stocks last) with a once off Makers Mark bourbon dipping sauce. les le bon temps rouler!! Winter is quickly coming to an end and we have hardly drunk enough whisky so NOLA and Talisker have teamed up to help you embrace that winter chill. What better way to celebrate the end of winter then to set a bunch of stuff on fire and drink the delicious peaty goodness that is Talisker. Grab a camping mug and come enjoy a few belly warming Hot Toddies and Smokey Whiskey. Chat over all things whisky with Diego Whisky Ambassador’s Simon Mcgoram & Andrew McIntyre. Fill the belly with a NOLA food collaboration with legend Alana Brabin from If You're Game and fill your ears with the bluegrass gypsy vibes of by Runebilly Rattle and Jimmy Bay. Whisky, beer and soul food. Now that’s what we call a good Thursday night. We’re bringing together two of our favorite Aussie producers and throwing in some tasty treats of our own. Starward Distillery and Little Bang Brewery will join us to create 5 unique whisky/beer/food combinations. We are going to start the night off with a delicious little whisky cocktail then sit back and listen to Starward Brand Ambassador ‘Alex Hart’ walk you through four whiskies in the Starward range, plus something a little bit special direct from the distillery. Ryan, or maybe Fil, or maybe both will join in to chat through 5 matching Littlebang beers. NOLA’s chefs have created a small dish to match each of the boilermaker combos and to help line the stomach. Once you’re done, jump into the downstairs bar and soak in the vibes of our Thursday night live music. If you love whisky and beer this cannot be missed. Time: 6:30pm for a 7pm start. To celebrate we're throwing another birthday beer festival featuring 26 of our favourite one-off or specialty beers from 26 of our favourite brewers (Beer list coming soon). It's bound to be a cracking weekend, come and share a few and toast to a few more! 🍻 Can't wait to see you here! Dan ‘Whisky’ Wooley, 6 nips of Laphroaig and a personalized bottle to take home. Now that’s what I call a whisky tasting. Come listen to Dan ‘Whisky’ Wooley walk you through the whiskies he holds so closely to his heart. This very limited, super premium tasting will allow you to taste some of the best whiskies to come out of the Laphroaig distillery. Yep, that includes NOLA’s most expensive whisky, The Laphroaig 30yo. And as if that’s not already enough, you’ll also get to take home a personalized Laphroaig Select Cask to take home with you. If you love Laphroiag this master-class cannot be missed. Could there be a better start to a Saturday than a private Zwanze tasting in your own commemorative Zwanze 2017 glass accompanied by some funky cheese and NOLA snacks. We think not. The only way to secure yourself a glass of Zwanze 2017 will be to grab a ticket to our private Zwanze event. - Cheese platters by Woodside Cheese Co. The American prohibition of 1920 and 1933 managed to wipe out close to all of America’s distilleries. The Whiskey Barons Collection is an undertaking to honor and recreate historically significant Bourbons that were lost after Prohibition. NOLA are lucky enough to be one of only twenty venues in Australia to launch Bond & Lillard and Old Ripy from the Whiskey Barron Collection. On Wednesday the 9th of August NOLA will host brand ambassador Tristram Fini as he walks you through a Kentucky Straight Bourbon Masterclass featuring Russell’s Reserve, Old Ripy and Bond & Lillard. Peat is an element of whisky that is appreciated but often ignored. Peat can tell us more then we think about our dram, from hints to its age to clues about its location. Come join the Nola crew and That Odd Whisky Coy as we explore how peat effects whiskys over time. That Odd Whisky Coy has put together a pretty special list for us to hone our skills on, so make sure you don’t miss out. Think whisky and chocolate. Then think about whisky in chocolate. Then think about eating whisky in chocolate while drinking whisky. We know, it sounds like a match made in whisky heaven. Balvenie produces a range of spectacular whisky in a very traditional style. Produced in Speyside's Dufftown, Balvenie whisky-making process is dedicated to maintaining the Five Rare Crafts. It's the only distillery in Scotland that still grows it's own barley using traditional floor maltings and keeps both a coppersmith and coopers on site. Chocolatier Steven Ter Horst is an East End neighbour and one we love working with. He says “the only thing better than a friend, is a friend with chocolate”, so we promptly made friends with him! His chocolates are world class and he is no stranger to pairing them with booze. Steven will be making the chocolates to perfectly match each whisky, even using the whisky in his recipes. He tries to play the matching off as hard work, but we will let you guys be the judges of that! This is one not to miss! Come into NOLA and listen to Steven Ter Horst and Balvenie Brand Ambassador Ross Blainey take you through some of the finer things in life. Hosted by Ross Blainey & Steven Ter Horst. The results on the field may be final, but the real battle will be won with pint in hand. 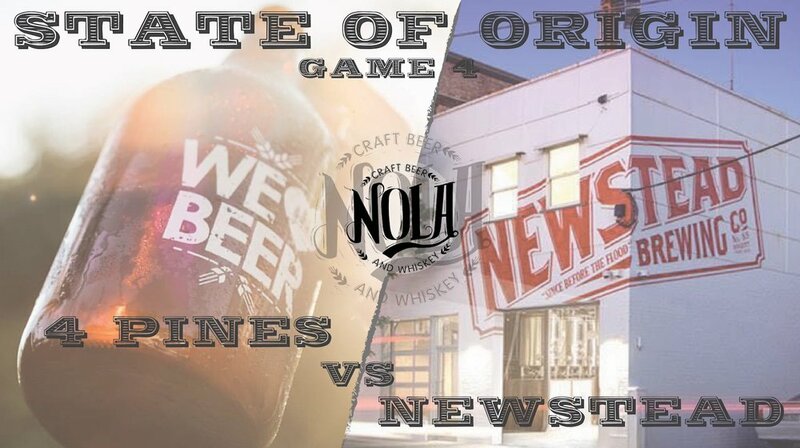 Join 4 Pines (NSW), Newstead (QLD) and some close friends as they take over NOLA's Taps to prove once and for all who is mightier 'The Cockroach' or 'The Cane Toad' ...... They're a strange bunch up there. 4 brewpub only releases being sent down from 4 pines and a bunch of seasonals being released by Newstead. Bar shouts and meet the brewers from 6pm, see you then. NOLA have teamed up with the best brewers of Wild and Farmhouse Ales in the Country. La Sirene are in town and bringing their unique farmhouse style to NOLA. Join head brewer Costa and Brewery Ambassador Will for a 5-course beer matched feast by NOLA's chefs on our mezzanine. The New Orleans cuisine has a strong French influence so you know there will be some cracking pairings with La Sirene's French inspired wild ales. What could be better after a big Saturday night than a recovery breakfast feast with your favourite bearded brewers? Join Ryan, Fil and the NOLA Crew in true relaxed Little Bang style as we enjoy a beer matched brekky/degustationey kinda thing. The beer list will include some Little Bang favourites and one off releases including a single keg of ‘Coco Hops’ brewed just for brekky. We love good beer. We love good whisky. So it goes without saying that we absolutely love a well-paired boilermaker. We’ve teamed up with Stomping Ground to create the perfect boilermaker beer. We won’t reveal too much yet but we can say it’s a twist on the classic Manhattan cocktail. Join us on Saturday, meet the brewer and taste through 4 Stomping Ground. Eat some food and kick on into the night with a Stomping Ground tap takeover, meet the brewer and brewers shouts into the night. Wednesday June 21st marks the Winter Solstice, our shortest day of the year, the only day worthy of celebrating the second release of Limeburner’s Darkest Winter. The days are cold, dark and short so waste no time and wash away the Winter blues with some of the countries best peated gems, each matched with unique dishes created by NOLA’s Chefs. Limeburners are flying over the very charismatic and knowledgeable Brand Ambassador Anthony Leadbetter to host the dinner and walk you lucky folk through each of the Limeburners expressions on offer. Over 30 dark beers in 3 days. Need we say more? Make the most of the long weekend and indulge in the Roasty, Chocolaty, Richness that are Stouts, Porters and Dark Ales. To kick things off on the Friday we are getting in our own go-to Trumpet player Chris 'Jazz' Webber, playing live alongside Dj's from 7pm. Keep an eye out for the full tap list soon. And we though an opening night with 6 sours was pushing the boundaries. Saturday the 27th of May come to NOLA and hone in on your hot sauce making skills. Chat to our chili grower and chefs about how to grow the best chilies and make the best sauces. You will be blending together your own perfect sauce using ingredients such as Pineapple and Rye Whiskey. Once you have discovered your blend of choice we will each be bottling up a 200ml of sauce to take home. All the while lets keep to creative juices flowing by sipping on a few neat bourbons. If you miss out on a ticket to our Laphroaig degustation, never fear, there will be yet another opportunity to celebrate Scotch. We’ll release our scotch menu to the world and Dan ‘Whisky’ Woolley will be roaming to answer all of your scotch related questions. Throw in some live music and chocolates matched to your favorite whiskies and you’ll be in for a good night. When you think of Scotch whisky, it’s hard to go past the iconic Laphroaig distillery and their uniquely peated range of Scotch. Dan ‘Whisky’ Woolley loves his Laphroaig and will be hosting a 5 course Laphroaig matched degustation with food by NOLA. Tin Shed Distilling is one of SA's premium whisky producers. Tin Shed’s distiller Ian Schmidt is responsible for producing the highly sort after Iniquity range. Take a seat, grab some chicken and listen to distiller Ian as he walks you through two batches of Iniquity as well as two specialty cask strength editions. What better way to get your lips around a few drams of this hard to come by SA Whisky. At $45 these limited seats this will sell out fast. What better way to end the year then to sit down and learn a little bit about a few great bourbons? In this session, Premium Spirit Brand Ambassador Erica Richards will be matching a bunch of the best local cured meats with some of their world class whiskeys. Think Bourbon and prosciutto or Rye and truffle salami. Be quick as there are very limited seats. Wow, it has already been a year! We feel like we’ve achieved a lot - between collaboration brews, degustation dinners, street parties, and even a friendly neighbourly dispute. We simply haven’t had a chance to just sit back and take it all in. Well, what better way to celebrate our first birthday than to throw a 2-day party and showcase what we do best. On the 26th and 27th of November 2016 NOLA is going to play host to a 2-day ‘Birthday Beer Fest’. NOLA’s ‘Birthday Beer Fest’ will be supporting some of the breweries that have helped us out over the last year. We will be parking The Beer Porterat the end of the laneway, allowing us to pour 26 different brews at a time from some of our favourite brewers. We will also be extending the good vibes into the NOLA laneway with live bands, Dj’s and pop up record storeCrackle & Pop Records. - Sunday recovery brunch featuring NOLA’s famous Moonshine Mary’s. All day brekkie will be served up fresh, as well us NOLA's green juices and all the Moonshine Mary's your hair of the dog can handle. Melbournemoonshine will also be hosting a free distillers masterclass so you can deep dive into the world of 'shining and the details behind the colab batch. This little number features native pepper berry, celery leaf & seed, smoked chili & salt. The first of four intimate degustations, hosted by NOLA. These Degustations are an opportunity for NOLA’s Head Chef Adam Hudson to showcase his abilities outside of the New Orleans style. In Deg #1, NOLA Adelaide have teamed up with McLaren Vale winery, Alpha Box and Dice, to put on a six course wine matched degustation. The six courses will make use of a whole pig, with paired wines by Alpha, Box and Dice Head Winemaker Sam Berketa. The Great Southern Distilling Company are fast becoming one of Australia's most highly regarded distilleries. Having taken out "Australians Champion Distiller” and producing Australia’s “Champion Whisky” for the past 2 years at the Australian Distilled Spirits Awards, it's not hard to see why. The guys behind Limeburners and Tiger Snake are in town, so we thought we would take the opportunity to introduce you all to them.